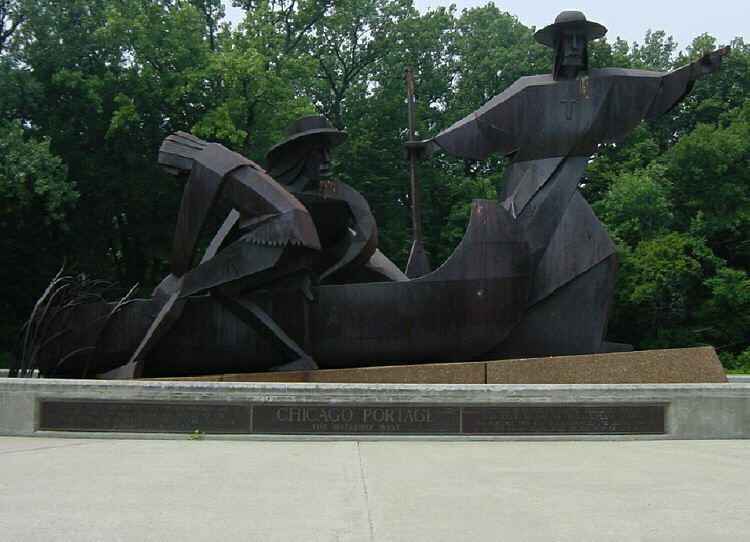 The Chicago Portage National Historic Site is located in Portage Woods Forest Preserve and Ottawa Trail Woods Forest Preserve. Portage Woods Forest Preserve is located at 4800 S. Harlem in Lyons, Illinois on the west side of Harlem Avenue (7200W) just north of the Stevenson Expressway (Interstate 55). Ottawa Trail Woods Forest Preserve is located just north of Portage Woods in Lyons, Illinois on the west side of Harlem Avenue between 47th Street and Joliet Road (old Rt. 66). The Chicago Portage is the birthplace of Chicago. A small portion of the historic connection between the Great Lakes and the Mississippi waterways is preserved in the Forest Preserve District of Cook County’s Portage Woods and Ottawa Trail Woods. It is one of only two National Historic Sites in Illinois and one of the few in the country that is not owned by the National Park Service. Chicago owes its very existence as a city to the location of the Chicago Portage. Long used by Native Americans, the portage was revealed to French explorers Pere Jacques Marquette and Louis Jolliet in 1673 by their Native American guides. It provided an easy connection between the Atlantic and the Gulf of Mexico by linking Lake Michigan with the Mississippi River. Jolliet suggested then a that a short canal cut through the portage area would create a vital transportation and trade connection. Although it was more than 160 years before it was dug, watered and opened, the 97 mile long Illinois & Michigan Canal (I&M Canal) was completed in 1848. It connected the Chicago River at Bridgeport to LaSalle on the Illinois River and ultimately completed the connection envisioned by Jolliet. The canal and its construction were the immediate spurs to Chicago’s exponential growth from a small settlement to a major city and the transportation hub of the nation. Since that time nearly every site of Chicago’s origin’s has been destroyed. The remains of Fort Dearborn are buried under three layers of Wacker Drive, you can't visit DuSable & Kinzie's cabin, the Portage Trail is completely paved over and old “Mud Lake” is now the site of the world’s largest sewage treatment plant. The Chicago Portage National Historic Site is the only major remnant of the discovery and settlement of Chicago. remnant of Portage Creek, stretch out your arms and know that Jolliet, Marquette, LaSalle, Tonti, Point du Sable, Kinzie, Hubbard, Ogden, and countless anonomous others from the discovery, exploration and creation of Chicago passed within an arm's length of you. The late Tribune columnist John Husar, after touring the site called it: “Our sacred ground”. It is certainly Chicago’s “Plymouth Rock”.